Research over the past decade has demonstrated consistently that companies that hire and retain a more inclusive workforce benefit in many ways, including improved operational and financial performance and increased innovation. Yet, while women make up 46 percent of the total Colorado workforce, they comprise less than a third of STEM workers. And, not only do women enter STEM less often than men, they leave STEM careers more often. 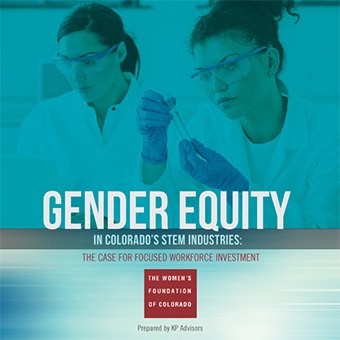 The report Gender Equity in Colorado’s STEM Industries: The Case for Focused Workforce Investment, by The Women’s Foundation of Colorado with the support of our STEM Coalition, is a roadmap to help companies recruit, retain, and advance women in STEM. It lays out the advantages for companies that create a more inclusive environment, provides a framework for companies to lead change from within, and includes a comprehensive list of resources (ranging from case studies to policies to facilitators that companies can use to accelerate progress toward gender equity and inclusion). The report was prepared by KP Advisors.